If there's one thing that characterizes leadership, it's the ability to affect positive change. We laud leaders who are visionary and inspirational, but ultimately what counts is what gets done. Here's where the old Woody Allen quote, "90% of success is just showing up," comes into play. Leading change is certainly a complex endeavor, but the first requirement for firm leaders is simply showing up. By that, I mean committing to the hard work over the long term to see change take root. The lack of this kind of management commitment, in my experience, is the number one reason change efforts fail (and the vast majority do). Unfortunately these tactics rarely, if ever, work. Not on their own, anyway. That's because real change doesn't take place in outward forms; it requires inward transitions. In other words, corporate change doesn't happen until individual change does. And that takes time, longer than many firm managers are willing or able to commit to. I learned this firsthand as a manager. We had several change efforts going (too many, I'm sure). So when I felt we had made significant progress on one to shift my attention elsewhere, I'd soon discover we were backtracking where I thought we had reached a beachhead. I was repeatedly surprised to learn how much I needed to keep pushing to keep change going. 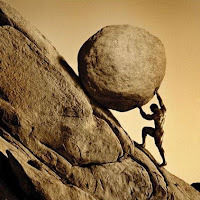 You might call it the Sisyphus Principle, where the weight of doing things the old way is constantly threatening to undo the progress you've made--until the transformation has been internalized. Leading that transformation requires more than smarts and starts. It demands hard work and endurance over the long haul. I've worked with a lot of companies that valued my experience and ideas to help them change and improve. But few have been able or willing to make the investment of management time and attention that was really needed. These firm leaders didn't necessarily lack the ability, just the availability. I've learned a lot about leading change efforts, but I've yet to discover any shortcuts. So what should you take from this? First, set realistic expectations. If reaching your goals is important, consider how much effort is really needed. Then determine if you can commit that much time and attention to it. If not, scale back your goals. False ascents up the mountain of change not only fall short of the goal, but discourage people from committing to future change efforts. Second, carefully budget time and attention. There's a limited supply. Firm leaders commonly over-commit then under-achieve when it comes to change. Manage change initiatives like projects, defining the tasks, manpower, time, and money needed to get the job done. Don't double-book. Whatever is committed to a specific change effort should be off-loaded somewhere else. Remember people are already suffering from mental overload. To keep the desired change at the forefront of their minds, you have to keep it constantly in the corporate conversation. Finally, don't make promises you can't (or won't) keep. This is a matter of your integrity and credibility. Without it, you can never build the trust necessary to guide people through the transformation. In the end, trust is the bedrock on which sustained change must be built.